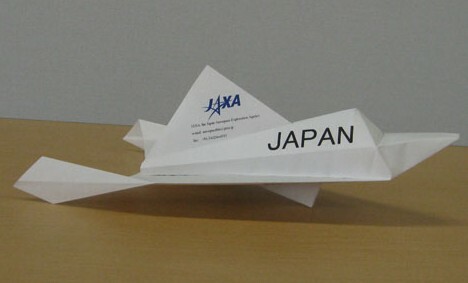 Japanese precision machinery manufacturer Castem has sent nine origami space shuttles to the Japan Aerospace Exploration Agency (JAXA) office in Houston, it was announced on October 7. If all goes as planned, the paper planes will conduct experimental flights from the space station to Earth early next year. The 29-gram (1 oz) origami shuttles, which measure 38 centimeters (14 in) long and 22 centimeter (9 in) wide, are made from lightweight but durable sugar cane fiber paper that has been chemically treated to resist heat and water. 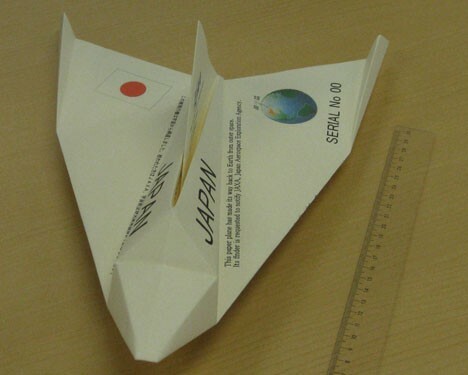 Developed by JAXA and the University of Tokyo, the special paper has already been used to construct a miniature prototype shuttle, which was tested in a hypersonic wind tunnel in January. In that test, the prototype survived wind speeds of Mach 7 (8,600 kph/ 5,300 mph) and temperatures of around 200 degrees Celsius (nearly 400 degrees Fahrenheit). 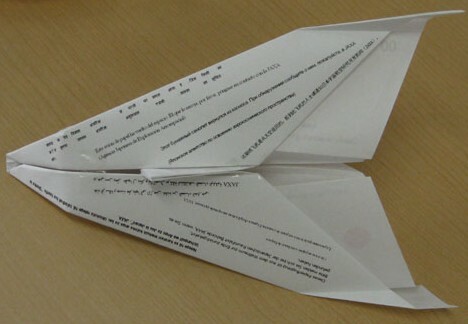 If NASA approves, the Space Shuttle Discovery will carry the origami planes to the International Space Station (ISS) in February 2009. JAXA astronaut Dr. Koichi Wakata, who will be living aboard ISS when the origami planes arrive, will carry out the experiment from the Kibo Japanese Experiment Module. It is yet to be decided whether Wakata himself will throw the paper planes or whether he will use the space station's robotic arm. In either case, JAXA estimates it will take two days for the origami shuttles to complete the 400-kilometer (250 mi) journey from ISS to the planet surface. 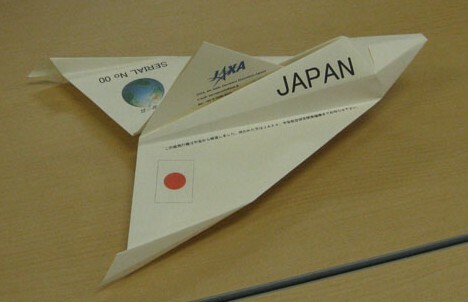 A message printed beneath the wings identifies the plane, explains that it has completed a return journey from the space station, and requests the finder to contact JAXA. The message is printed in 10 different languages, including Japanese, English, Chinese, Hindi, and Arabic. Japan Origami Airplane Association chairman Takuo Toda, a strong proponent of the experiment, says he hopes the test flights will help engineers develop new types of lightweight spacecraft in the future. What about Dumb? it is written in dumb too? Please, i need to know! @ dumb-ard the only thing that is dumb on this site is your attitude. I think this is wonderful, just wonderful. I look forward to reading about the craft's journey from it's landing/crash site back to JAXA. Simply amazing. How amazing would it be if you were walking down the street and one of these just landed in front of you? Wonderful! So where does one get the origami instructions on making one of these? Heya i?m for the primary time here. I found this board and I find It really helpful & it helped me out a lot. I'm hoping to give something back and aid others like you aided me. I know this thread is completely dead, but it's one of the first links to come up if you research JAXA paper plane. So for everyone wanting to know how to make it, the link is: [https://www.youtube.com/watch?v=1Yoo0oYFwIc] Hope this helps someone else, because it helped me.